He embraced his greying locks last year, ditching the dye to show off his silver locks. 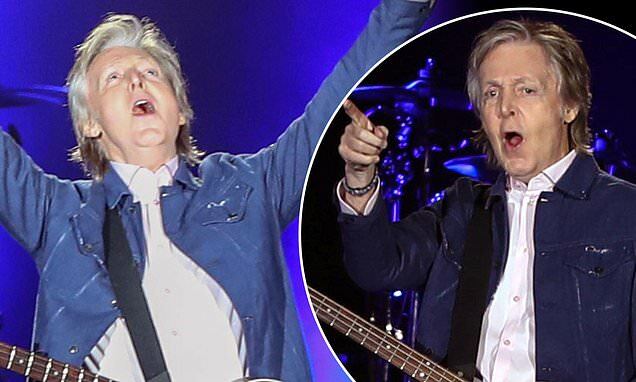 Yet Sir Paul McCartney looked far younger than his 76 years as he took to the stage for an energetic performance in Santiago, Chile, on Wednesday. The Beatles legend seemed in high spirits as he took to stage in front of hundreds of screaming fans on another leg of his tour. Throwing his arms up in the air, the Say Say Say singer whipped the crowd up into a frenzy as he showed off his moves. Dressed casually for the occasion, the singer donned a navy jacket, teamed with black jeans and a white shirt. The music legend is currently on his Freshen Up tour, which began on September 17 in Canada and will conclude on July 13 at Dodger Stadium in Los Angeles.